Windows 8 Comes with Refresh and Resets feature, Resets allows you to reinstall Windows to its factory settings and on the other hand Refresh Allows you to restore personal files, basically creates a Windows Installer Image (WIM) to carry out the assigned tasks, i.e., restore default PC settings. 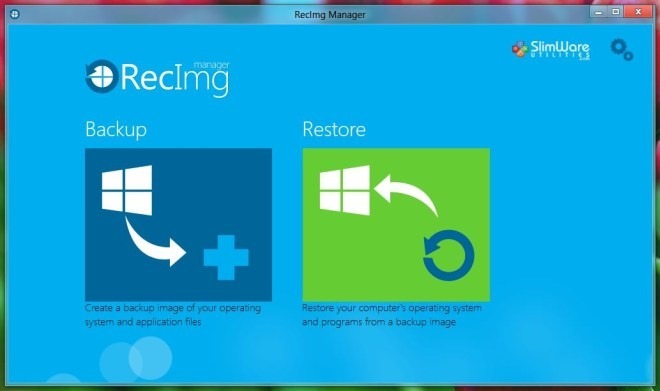 SlimWare Utilities comes with a new Windows 8 App RecImg Manager, which allows you to backup and restore windows 8 without losing your software or files! The best part of the free app is it restore and reinstall entire Windows 8 Operating system and software in minutes without losing personal documents or files. 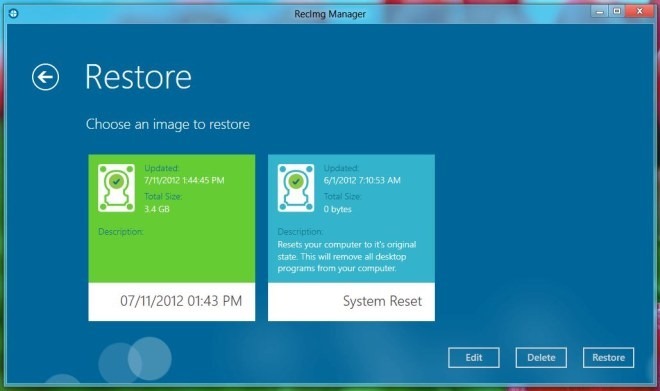 RecImg Manager will work on any device running Windows 8. There are so app available on the net which allows you the same, but those apps don’t contain documents, user settings, etc. But RecImg Manager helps you to restore your system to its original state without personal data loss. The app has a neat and elegant metro look and compatible to all windows 8 Device or Touch tablets. 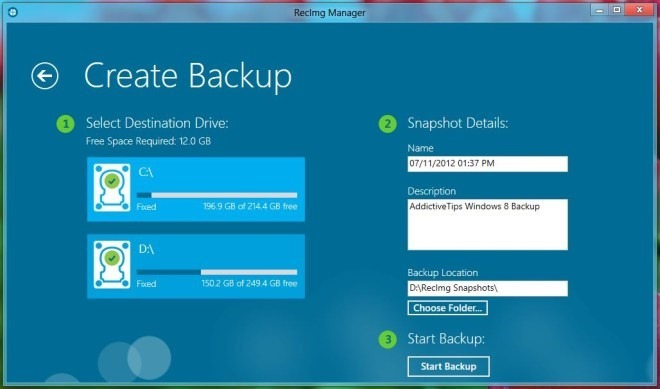 All you have to do is install the app on your Windows 8 Pc and click few buttons to create a new backup or to restore a previously created one. Select the option what you want and destination folder where you want to store the backup file or want to restore from the previous backup file. Once everything’s in place, click Start Backup to begin the process. It will take few minutes to complete. So, in future if you want to restore the backup than hit the Restore Option to restore all you data without losing any file and setting on your Windows 8 PC. Select the Image files file from the destination folder and hit the Restore Button. That’s it! The app also allows you to schedule the backup process, RecImg Manager can easily be configured to take system snapshots at scheduled intervals. This helps to ensure your operating system is always properly backed up.